A few weeks ago I was talking with the fish guy at Whole Foods, as has become my habit. I don't know all that much about cooking fish and have been reluctant to tackle it at home. In the past, when I ate out more often, I would make a point of ordering fish whenever possible partly to avoid having to prepare it at home but still be able to enjoy it on a somewhat regular basis. It is no surprise that I have so little experience with fish. The only fish we had at home when I was growing up was canned salmon, canned tuna, and some solid frozen block of tasteless mush that seemed common in the '70s - halibut or haddock or something like that. The canned tuna went into a pretty decent salad but the salmon went into an especially dreadful dinnertime nemesis of mine: the dreaded salmon croquette. And the block of fish ice went into the oven as is and then was splashed with lemon juice (bottled) just before serving. It was pretty disgusting. Like most children in America, the only fish I truly liked was fish sticks, and that was mainly as a vehicle for tartar sauce. As an adult, that morphed into a love for breaded fried fish and that was pretty much it for me. These days I eat all kinds of fish - fried, grilled, broiled, poached; even raw. It took some getting used to, but I love sushi and tuna tartare. Basically, if someone else is preparing it for me, I love all fish. Sadly, however, these days the only way I'm likely to have fish is if I prepare it myself. The first technique I learned was how to broil it; mostly salmon and the occasional tilapia. To my mind, there is little finer in the world than a nice piece of salmon seasoned with salt, pepper, garlic and dill and broiled just to the barest hint of doneness. Whenever I wanted fish I would hope that the salmon or tilapia looked good and if it didn't I would change my dinner plans. 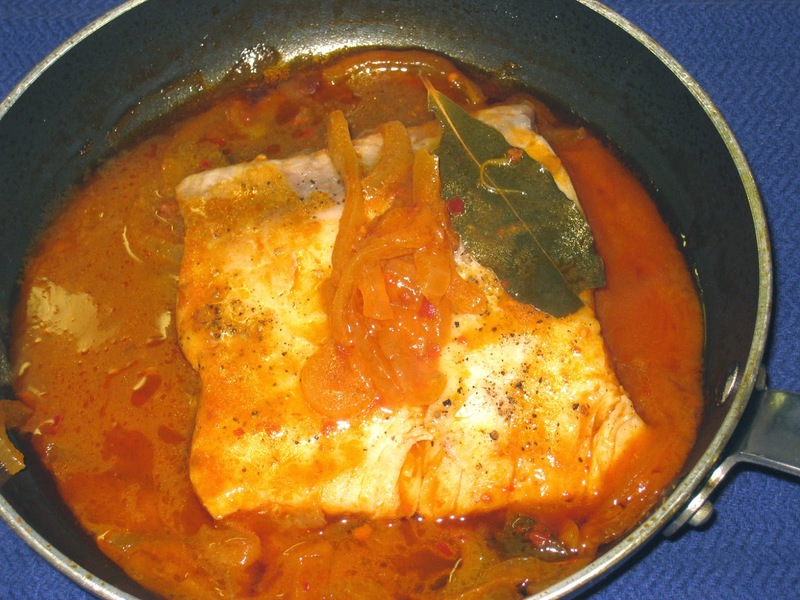 I've been looking to expand my repertoire, both with techniques and with kinds of fish, and I found a recipe I had pulled out of Bon Appetit a while ago for poached cod with tomato and saffron. I decided to try it on some cod I had finally mustered the courage to purchase, and was pleased with the results. So pleased that I started looking for opportunities to purchase firm white-fleshed fish so I could practice some more, and fiddle with the recipe as is my wont, and poaching has become a staple in my repertoire. There have been a few occasions when I was browsing the fish department when I ran across paiche . I had never heard of it before, so I asked what it was. Turns out it is a large white-fleshed fish native to the Amazon that has barely changed from the Miocene epoch thousands of years ago. All I knew was that it looked good so I brought some home with me. It made for a most flavorful dish. This recipe is quick and easy, and only takes about half an hour from start to finish. It is a perfect dinner for those nights when you want something special but don't have a lot of time or energy for anything complicated. Drop the saffron threads in 1/4 cup of warm water and let steep while you prepare the rest of the ingredients. Heat the oil in a medium skillet over medium heat. Add garlic and/or onion and cook, stirring often, until the onion is just translucent. Do not let it color. Reduce the heat to medium-low. Season the fish and place it in the skillet. Cover the skillet and let the fish simmer until it is opaque and starting to flake, 10 to 20 minutes depending on the thickness of the pieces. Serve the fish in shallow bowls with the poaching liquid spponed over it.